When we started our business we were located in the same building as Eastern Agency on Aging – 81 Main Street in Downtown Bangor, Maine. The building is small and there always seemed to be a steady stream of people going in and out of their offices. One of those people, Carol Higgins-Taylor was one of those people. She worked for the agency. I met her one day and every day since when I see her she puts a smile on my face. She is warm, smart and hysterical. I met Carol 15 years ago. Lots of things were different back then, my father was alive, my Mom newly widowed, I was newly divorced and living in a new town with a new company. But Carol is the same. Friendly, kind and whenever I have a question about getting help or advice in being a better daughter to aging parents, I can email Carol. Today, Carol owns a PR Agency, (and our office has moved too), her specialty is Seniors and families. She often points me back to Eastern Agency on Aging and even though Mom is in Southern Maine, the resources are there too. I say this all the time. Usually, it means, Knowledge gives me “piece of mind.” I hate feeling like I cannot help my Mother. I need support to navigate our (Mom’s and mine) journey together. 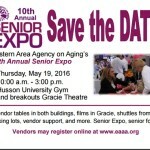 Thursday, May 26th at Husson is the Senior Expo. While you may think this is JUST for the OLD FOLKS it isn’t. In the Newman Gym there are exhibitors – It really is a big Resource Room. Come through, browse at your leisure. It’s FREE. And starting at 10am are Presentations in the Meeting House/Gracie Theatre Building. A Wide range of topics, Living With a Wound, Healthy Living For Your Brain and Body, Caregiving for your loved one with Dementia to Chair Yoga. Come See, Come Learn. Stay for as long as you can. Feel the power of the Network. With Carol at the Helm of this Event, it is something not to miss. *Carol Higgins-Taylor – preceding her weekly Radio Show Senior Talk on WVOM. Click here FMI.